Evelynn Marston didn’t mean to burn down the science room. A little anger, some flames, and an expulsion later, Evie finds herself destined to spend the rest of her high school years at Despaign Academy — named for Connecticut’s last convicted witch. When Evie’s friend, Laurie Silver, turns up dead, Evie must rely on all her newfound powers and friends to find the truth. But bringing a killer to justice may require stronger magic and true love, the kind that can’t be found in a potion. Will Evie be able to bring this killer to justice? To uncover a little of the magic in Evie’s life, Kristy Tate, the author of ‘Witch Ways’ is joining me today. Kristy, what thoughts originally led to ‘Witch Way’? I had a thought–every day I have to decide what kind of person I want to be. And that turned into, everyday I have to decide whether or not to be a witch. That’s an interesting transition of thought there, and I find it so intersting that you took it further and built your book around this idea. Were there other ideas from your life that you also built into your tale? Yes, like Evie, I lived alone with my father (although, Evie lives with her uncle) and I had to watch my father remarry. It seems like a lot of your thoughts were driven from your teenage life. Yes, I drew a lot on my own teenage experiences. I really think that the teenage years leave a huge impression on a person, so I find it easy to understand how so much of your novel is drawn from these years. As you look back on this time and how it inspired your writing, what did you feel was the most important thing that you wanted to take and share with your readers? That we each decide the lives we want to create and it doesn’t really matter what our parents or friends or lover may want for us, we each have to make our own life choices. Do you find the process of writing and showing life choices in action exhausting or does it energise you? And when you have all of the energy moving around and you’re in the zone, what are you thinking about as you’re getting those words onto the paper? I think of people who are leading difficult, messy, and complicated lives and how they might need to escape into a story. I love that you’re thinking about how to make people’s lives better through story as you write, it really shows how much you consider you reader and their needs. I think that this attention to your audience will make you a great writer. As you’ve kept builing on your writing skills, how do you think you’ve progressed to make better work? A few people have told me my writing as improved. One brave friend told me my writing has lost it’s “tonality.” Which means it’s less literary. I definitely think it’s changed, but for better or for worse depends on who you ask. To me it sounds like there’s more people who have seen improvements with your work, so I think they win. As you’ve kept progressing I’m sure you’ve kept having ideas, so can you share a little about the next idea that you’re turning into a book? I’m writing and soon hope to finish The Billionaire and His Misbehaving Beagle. It’s a clean and wholesome romance and it’s been a hoot to write because I once had a very naughty beagle. *Laughs* I’ve known a few beagles in my time too and they’ve all been very naughty to the point of being hilariously funny. I’m sure your beagle has caused enough antics to make an awesome read! As we know that you can create an awesome read, I’d love to dig a little deeper into your life to see a little more about the author behind the tale. Let’s start with, are you left or right handed? And when you’re writing with your right hand, what’s your favourite word to use? Love it! Let’s see if we can follow the love into logic and see if we can solve a little mystery. The mystery to solve today is, if money doesn’t grow on trees then why do banks have branches? For the same reason we drive on parkways and park in driveways. *Laughs* I think that logic works! Let’s see if we can get that logic happening again with, if space is a vacuum, who changes the bags? So, it’s a modern vaccum model. That’s good, I’m sure it makes it easier to tidy up! And to tidy up our interview into a little package of awesome, let’s round up our chat with my final question, if you invented a monster what would it look like and what would you call it? I have invented many monsters. In Witch Ways, there is a Creature of the Chasm and he’s a shape shifter. Well, I think we need to all meet the Creature of the Chasm face-to-face and the only way to do that is to pick up a copy of Witch Ways. Kristy, thanks so much for sharing a little insight into the ways of the witch, and I wish you the best of luck wrangling your fictional beagle into your next project! Excited to read the book we discussed today? Find it here on Amazon: ‘Witch Ways ( ASIN: B00ZIY5IYQ )‘. 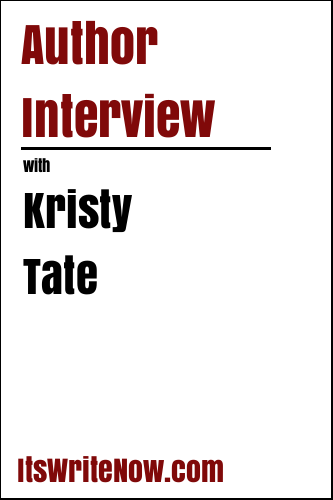 Want to find out more about Kristy Tate? Connect here!